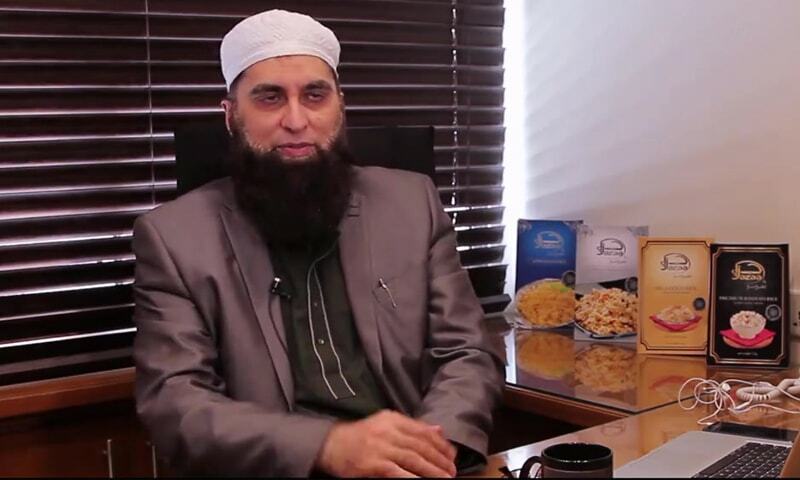 rticulate, insightful, intelligent and – despite the criticism often directed his way – extremely optimistic, was my initial perception of Junaid Jamshed when I first met him a few months ago at the launch of Jazaa Foods, his FMCG enterprise. His journey, from a pop music icon with Vital Signs in the late 1980s, the change of heart and image that brought him back into the spotlight as a religious scholar in the late 1990s, to the dynamic businessman he is today, has been intriguing to say the least. 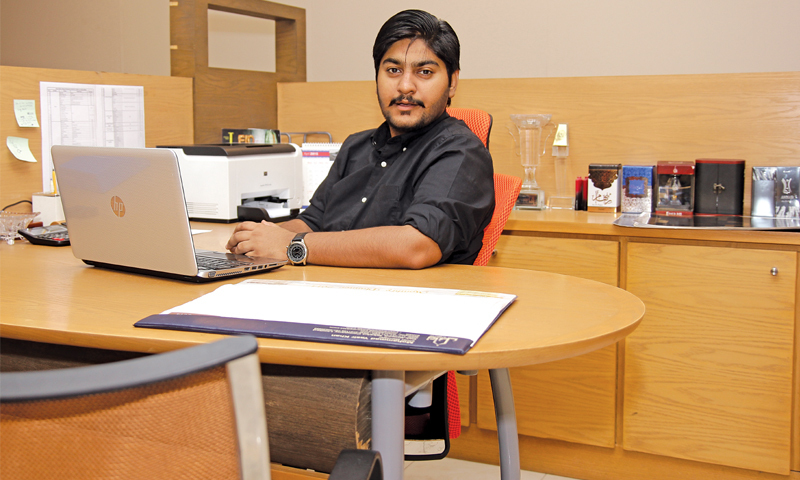 Given the increasingly diverse product launches that he brought to the market recently, this was perhaps the ideal time to find out exactly what it is that drives Jamshed. He comes from a family of decorated armed forces officers, a fact he shares with great pride; it was therefore expected of him and his two brothers to follow suit. Weak eyesight kept him out of the Air Force, so he joined the Pakistan Army, but once he began dabbling in music, the rigours of army training became too time-consuming to handle. He quit and enrolled at the University of Engineering and Technology in Lahore in 1985, graduated as an engineer and started his first job. That career switch, however, also turned out to be temporary. When 'Dil Dil Pakistan' was released on August 14, 1987 and became a chartbuster, it propelled Jamshed and his band members Rohail Hyatt and Shahzad Hasan to instant stardom. Pursuing a full-time engineering job was no longer feasible and Jamshed plunged headlong into the world of pop music, a first for anyone in his family. With a predominantly female fan following,he made, what many considered, another surprising decision: he got married at 26. Before I could ask why he chose to start a clothing business, he says that his extensive travels during his Vital Signs days exposed him to the latest fashion trends from across the world. Since looking good constituted a major part of his image and there was a dearth of local designers, he often ended up designing his own clothes. Relying on his sense of fashion and “instinctively knowing what looks good," encouraged him to try his hand at fashion design. A survey of local markets made it evident that there were no quality options available for people who wanted to wear a smartly-cut and tailored shalwar kameez. As he was undergoing a personal metamorphosis during this time and was in the process of changing his wardrobe, he felt the absence of a shalwar kameez brand even more acutely. As soon as an opportunity came his way a few years later, Jamshed instantly decided to act upon it without delay (his signature personality trait). Along with his partner Sohail Hamid Khan, J. was launched in 2000, with the idea of creating custom-made khaddi shalwar kameez suits for men. The design philosophy for J. was simple; his own sense of style reflected in every article the brand designed. The risk began paying dividends and within a few years, J. expanded its portfolio to include a women’s line as well, supplemented by the launch of Almirah, a high-end ensemble brand. Initially, his involvement with both brands was extensive, with each design and print personally reviewed and approved. However, given the rapid expansion that J. experienced, professional textile designers were hired and Jamshed’s role became more strategic in nature. He is quick to point out that the one thing every J. store will always have are clothes in earth tones and whites, as these are the shades that appeal to him the most. In fact, he attributes his unprecedented success to implementing Islamic principles within each one of his businesses; a case in point was the Returns and Exchange Policy and loyalty card schemes that J. initiated. In his opinion, these policy decisions gave instant credibility to the brand, which in turn led to customer loyalty and retention. What I find interesting is that despite never having studied marketing, Jamshed seems to have a flair for transforming a ‘Big Idea’ into a lucrative product that resonates with the target audience. He invested in Meat One, the first time a halal, packaged premium-quality meat brand was launched in Pakistan, believing that if people are given the option of buying hygienic meat, they will do so. This year alone, with an unrelenting focus on quality and innovation, he entered the food business by launching Jazaa rice, the cosmetic industry with halal makeup, and the personal grooming category with J. Fragrances. Reminiscing, he says it was his mentor, Shoaib Mansoor, who instilled in him the importance of delivering value to people and keeping them engaged; not only in terms of his fans during his music days, but the team responsible for putting his shows together as well. He seems to have carried those values with him. Perhaps that is why he commands unquestioned loyalty and respect from the people he works with; in his absence (as I discovered when dealing with his team) he is reverentially and fondly referred to as ‘Sir JJ’. As our hour-long conversation draws to a close, I brought up the media backlash he and his family had to face when a few of his controversial statements came to light. Fully prepared for an evasion, the directness of the response left me surprised. 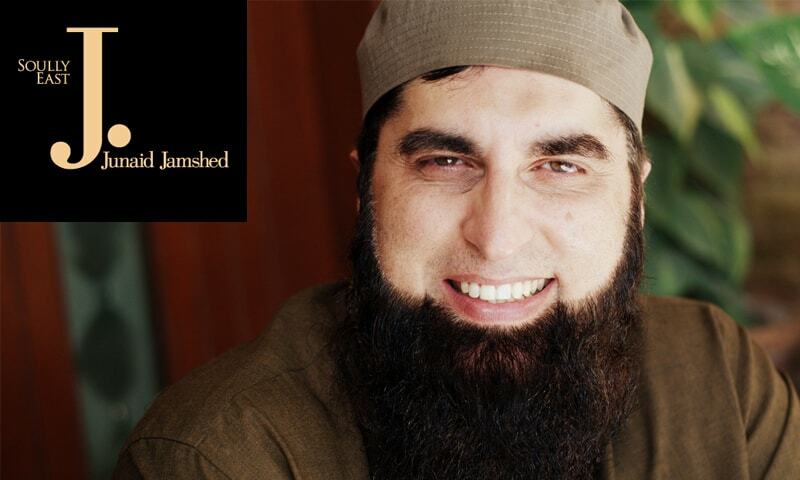 Irrespective of his personal or religious views, the popularity of J. which has transcended geographical boundaries, and the unexpected success (in the local and international market) that Jazaa rice, J. Fragrances and Meat One have achieved are testament to the fact that Jamshed’s success deserves recognition. Given his indefatigable optimism, market foresight and risk-taking nature, no one should be surprised, if in the coming months, we come across yet another innovation from ‘JJ’. This article was published in the Nov-Dec 2016 Aurora Magazine issue. 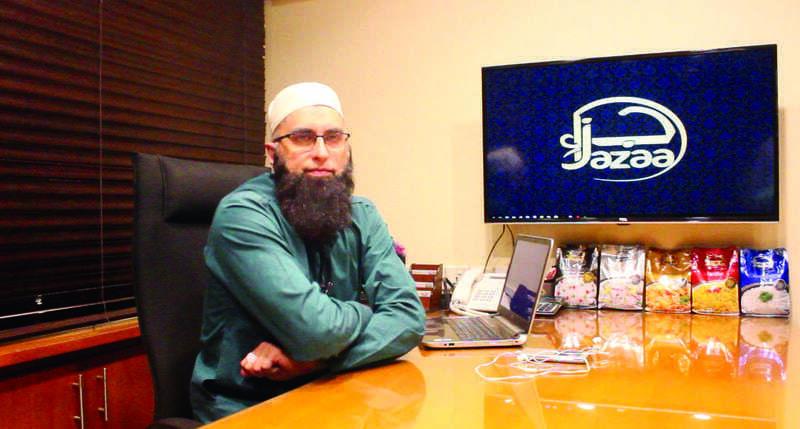 he much-criticised singer-turned-televangelist Junaid Jamshed may not be politically and religiously correct and has had his fair share of highs and lows, but the brand J. has consistently enjoyed strong sales over the last decade. This was evident when on September 3, the company announced that many items in their collection had sold out and customers were therefore requested to first confirm the availability of their item through an online request. This was not quite what may have been expected after Jamshed was accused of making misogynistic remarks about women in July. Yet, a closer look at the brand’s core strategy suggests that the franchise is not totally built upon Jamshed’s celebrity but is backed by a solid business model with a strong value proposition. Here are three vital lessons from J.’s success story. Lessons that demonstrate what it takes to separate winners from losers and how J. has used good design and in-trend fashion as a medium to influence the way consumers feel, think, and act towards patronising its stores. People’s choice of clothes is a statement about themselves, their values and identity. However, in the case of Pakistan’s clothing industry, the value curves of most players are virtually identical. So the real challenge for a fashion house is to remodel the market boundaries and break away from the competition. The company has successfully created a demand for Shariah-compliant designer outfits, with all the clothes approved and co-designed by religious figures such as Mufti Najeeb. This particular business model has given the brand a sustainable competitive advantage as existing fashion brands cannot imitate this model. Moving to an ‘Islamic’ mode would not only erode another brand’s original customer base, the fact is that this particular niche market is not lucrative enough to support multiple players. With such barriers in place, J. can continue to enjoy swimming in the clear blue waters of new market space for years to come. Many run-of-the-mill fashion houses perceive consumers as passive recipients of their brand message. This does not make sense in the context of a complex business environment where brands need to evolve in response to changing consumer perception. J. was quick to realise this when the brand coined its tagline 'Soully East' last year to emphasise its tilt towards eastern values. This has helped the company design creative marketing campaigns - J. has a policy of not showing faces on its billboard advertisements. Most of its advertisements depict designs of the brand's prints superimposed on other objects such as yachts, vintage cars and flowers. J. saves a lot of money by not having to hire expensive models for its photoshoots, nor does it rely a lot on TV commercials. Jamshed, as the primary face of the brand himself, subtly promotes the business by participating in various TV shows. Furthermore, the house rarely advertises its gold and silver card customer loyalty program, and frankly it doesn’t need to as at present, the loyalty program has over one million customers. Such is the power of word-of-mouth marketing! Final word: Jamshed is not the Richard Branson of Pakistan but his personality traits have strongly influenced J.’s brand personality. Until now, the brand has thrived not because of his charisma but because of an inherent strong business model and a unique branding strategy which is difficult to imitate. Fashion branding is all about multimillion-dollar budgets, celebrity endorsements and creating media hype – however it also involves telling a compelling story. Jamshed’s misogynistic comments and misadventures call for a decoupling of the brand from the image of the veteran singer himself and give a strongly independent identity to the brand. After all we believe that every brand has a story to tell and J. is no different. However, the most important thing is to tell the right story the right way — one that provides value to the consumers. This article was originally published in Oct 2016 on Aurora's online blog. espite an international taste preference and demand for Pakistani rice, Pakistan has dropped to 13th place in terms of global rice production (despite the opportunity to increase its market size by 50%), mainly because of a lack of quality variants (Source: United States Department of Agriculture, 2016). Recognising this demand-supply gap, Jazaa Foods (an FMCG company established by Junaid Jamshed in November 2015) launched Jazaa rice in March this year as a premium quality brand designed to tap into this global market potential. The Pakistan Bureau of Statistics estimates the total volume of the rice industry at approximately 6.9 million metric tons, of which 40 to 45% goes towards local consumption and the rest is exported. The category comprises basmati (Pakistan’s claim to fame, grown in Punjab), irri (cultivated in Sindh), parboiled (colloquially known as sela in Punjab) and brown rice (grown on a very limited scale on rocky terrains in Northern Pakistan). The name of the company as well as the brand originated from this extensive focus on delivering value-added products. Jazaa translates to ‘reward’ or a ‘fulfilling return’, which is appropriate, as Jamshed’s vision for Jazaa Foods is to establish Pakistan’s first FMCG initiative producing branded consumption commodities of the highest quality. Implementing this vision meant that the pricing strategy had to be carefully devised so that the brand would be affordable across most socio-economic groups. 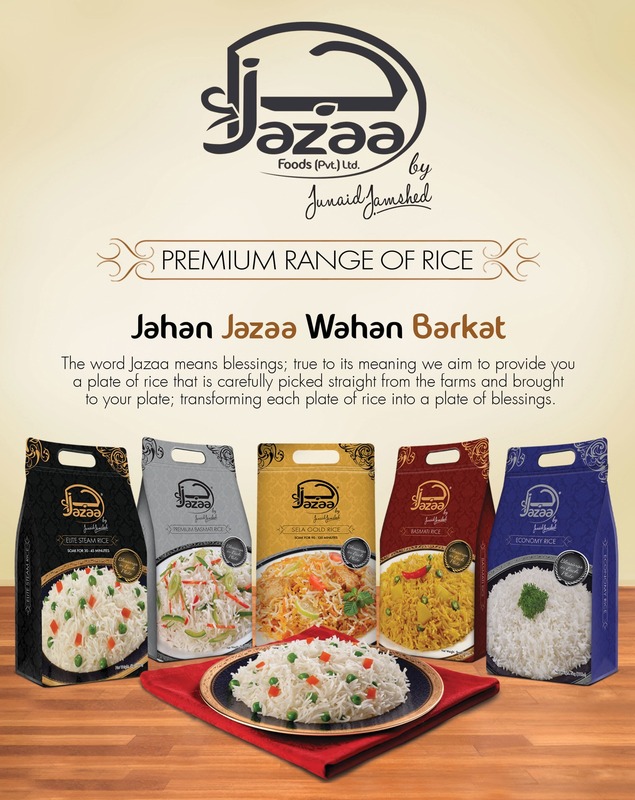 To ensure this, Jazaa rice was launched in five variants, each of which has two SKUs: Jazaa Elite Steam Rice (Rs 199/one kg; Rs 985/five kg), Jazaa Premium Basmati (Rs 170/one kg; Rs 840/five kg), Sela Gold Rice (Rs 160/one kg; Rs 790/five kg), Basmati Rice (Rs 140/one kg; Rs 690/five kg) and Economy Rice (Rs 110/one kg; Rs 540/5 kg). To put it into context, a one-kilogram pack of unbranded rice sells for between Rs90 and Rs100, while a similar quantity of branded rice is priced at between Rs120 and Rs160. Industry insiders have often pinpointed the lack of adequate processing facilities as the reason why Pakistani rice is of poor quality and Jazaa Foods expected to encounter a similar challenge. However, the team was pleasantly surprised to find that a robust infrastructure for refining, processing and packaging rice was already in place. The problem, they discovered, is that the major rice players prefer to minimise the cost of production and are thus unwilling to make the required investment to improve quality. While the brand vision is to take Jazaa rice global, currently the brand’s distribution (which began in Karachi) has been limited to supermarkets, grocery shops and kiryana stores across Pakistan. In the four months since its launch, Jazaa rice has managed to carve out a place for itself. The Jazaa Foods team is particularly proud of this achievement because instead of opting for an extensive ATL-driven prelaunch campaign, it opted to let word-of-mouth promotions drive sales. In addition, a chunk of the initial marketing budget was allocated to trade activation initiatives, including having store interceptors at select outlets hand out product samples to generate trial and consumption. “The rationale,” Jamshed states, “was that once people experience the taste of Jazaa rice, they will not be satisfied with any other brand or variety of rice.” Product placement in cooking shows, particularly during Ramazan, was also a strategy that helped increase brand awareness and recall. A traditional ATL campaign, conceived, designed and executed by Ailaan Advertising, was launched after the product distribution had started. Planning is now underway to launch export operations, where the challenge will be the extensive product quality and packaging regulations. This article was originally published in Aurora's Jul-Aug 2016 edition. Wonderful insights into business set by wonderful personality. Another distinguishing factor with J. products was the creation of unique advertisements that followed islamic guidelines. None of ads had any face of male or female models but still they were all success as they catered a huge target market that is rarely focused in our country. To cut it short, we can say... whatever he touched turned gold. He was exemplary throughout and have shown how to be a good role model. Great human being who left this world doing what he liked doing the most. JJ & Vital Signs have been the part of our lives since early 90s and we have grown listening to their beautiful songs. May the departed soul rests in eternal peace (Aameen). JJ was a Good Businessman. RIP. So impressive he is in this interview and talking casually. This shows his passion about this country, his businesses and the great religion. JJ will be missed in many ways. He is like someone who does anything success will come but he got strong intention to do and do rightly. Very interesting article. Junaid Bhai made his anme in this world and in the akhirat. He has helped lot of people. Great article and audio clips. People look for the recipe of "good life" everywhere through fair and unfair means. In the context of life, we all forget at the end we are accountable to our Creator. And there is no mercy from the creator when we deceive and cheat others. This guy reflected again that helping and caring for others in parallel with prayers without being selfish, prejudice and judgemental, as our Prophet (PBUH) did, we can create a profound impact in our life and beyond life. I closely followed his (JJ's) transitional phases and felt we need lot more people like him. This sudden loss has literally shaken me a lot. JJ was a great man who will be so sadly missed. Truly someone whom Pakistan could be proud of. He came in our Mosque right after sometime he changed from pop star to preacher. To be honest that day me and my friend offered Asar prayer just to see him in the mosque. I tried to take his autograph but was frightened by his religious look and thought he won't give me autograph. I aspire eternal peace for his departed soul. JJ a good person and always a great Muslim I Love JJ. JJ was with me in UET Lahore and I always accompanied vital sign band during their early concert in lahore and islamabad. Regret that after I left the UET, could not met him, not knowing that he will leave us soon. He was gem of a person. Rest in peace. 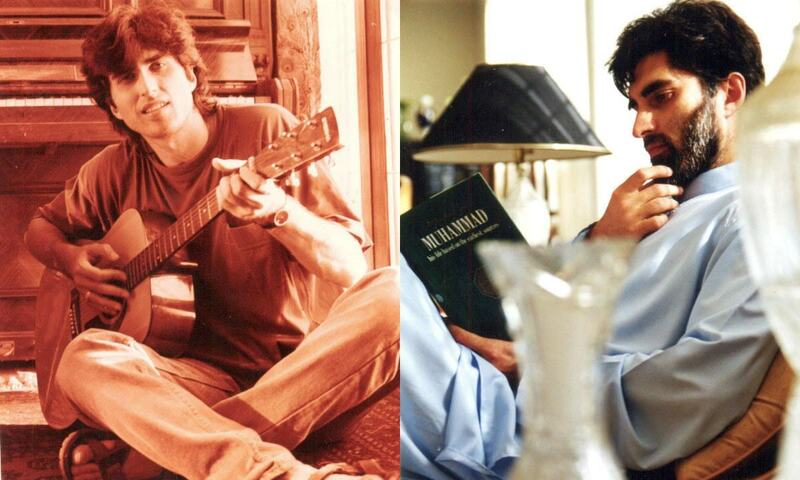 Many people never heard of Junaid Jamshed. I'm still a fan of all things Vital Signs. But you have to wonder if JJ would have been this popular if he wasn't as good looking as he was. Vital Signs had great songs but JJ was not a very strong singer. Most credit for Vital signs success should go to Shoaib Mansoor and Rohail Hyatt. He may have had a great marketing mind but I dont agree that he was the most intelligent of people. He had a number of confusions and conflicts in his mind, on one hand you are talking about the afterlife and how this life is temporary , on the other hand you are conducting business worth millions of Dollars like you will live forever. I will miss JJ but please dont make him larger then life. @M. Emad , those who have no sense of music have no knowledge about him. @Faisal Very good points. Yes. He looked a greater icon with a guitar in his hands than the contrived garb which he wore later. I read that he was a Pakhtun from KPK, and wonder if he spoke Pashto and recorded any Pashto songs, would love to hear them if they exist. @Faisal That is because he gave up life of music just for the closeness to Allah S.W.T.